On a Sunday walk along the Pine Ridge Trail during Level IV fire restrictions in 2013, we looked at dozens of fire rings and couldn’t find a single one that hadn’t been used the night before. Level III fire restrictions are currently in effect in the Los Padres National Forest. 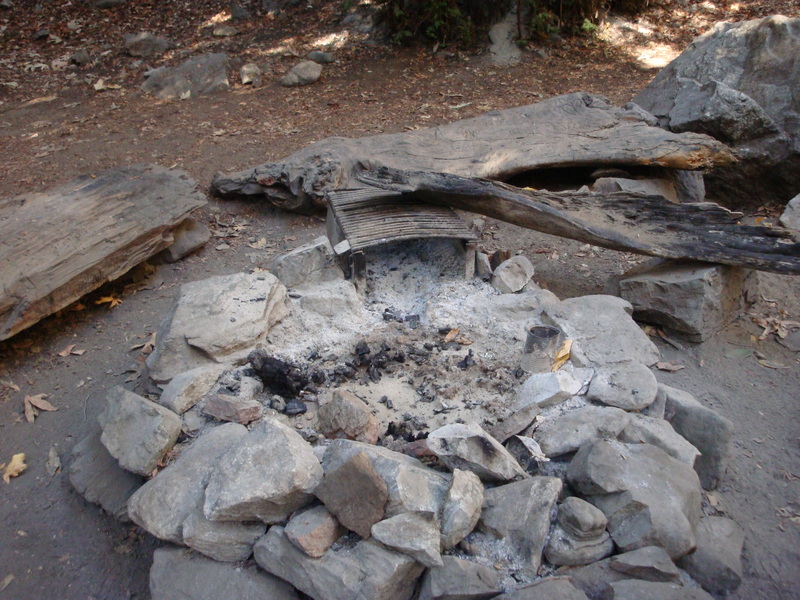 This means that all wood and charcoal fires are completely prohibited outside of a few designated Campfire Use sites (in designated car campgrounds). Smoking and recreational target shooting are similarly restricted. Lanterns and stoves may only be used with a Campfire Permit. This isn’t a secret. Signs informing the public that campfires are prohibited abound. In spite of this, and in spite of the fact that fire danger is obviously quite high, campers light dozens of fires along Big Sur’s backroads and trails every single night. My guess is that it’s a function of the same human failing that prevents us, in so many contexts, from seeing how seemingly harmless individual behavior can have a devastating cumulative effect. The campfire builder likely perceives, correctly, that there is little chance that his or her fire will be the one to cause a conflagration. After all, it’s probably fewer than one in a thousand illegal campfires that becomes a wildfire. To these campers, the suggestion that they are endangering life, property and forest resources seems uptight and exaggerated. The locals, on the other hand, have no difficulty seeing the bigger picture – that the many illegal campfires burning in the forest every night will, inevitably, result from time to time in major fires. The 1972 Molera Fire and the 2008 Indians Fire are prime examples of large fires started by campfires. So what’s the solution? Probably some combination of better enforcement and better face to face education. That’s why the Ventana Wilderness Alliance’s backcountry volunteers are so important and why the news that the Forest Service has begun patrolling the heavily impacted South Coast roads is so encouraging. This entry was posted on Thursday, June 30th, 2016 at 11:17 am and is filed under Big Sur, Fire, Flood & Apocalypse, Santa Lucias. You can follow any responses to this entry through the RSS 2.0 feed. You can leave a response, or trackback from your own site. Again, Thanks for spreading the word. It cannot be said too loudly or too often for us in the forest. We know the Chalk Fire of 2008 was not started by lightning. Was it arson or a campfire? Thank you Keith for highlighting this critical issue and for acknowledging the efforts of people like the Volunteer Wilderness Rangers. Education is critical as is enforcement. To have enforcement, we need to properly fund the US Forest Service. But instead, Congress has reduced funding for recreation management. That is not a solution. Until such a time, the Ventana Wilderness Alliance will continue to utilize volunteers, web resources and printed materials to educate people on how to enjoy their public lands responsibly. It’s reassuring that the Los Padres NF is proactively deploying Fire staff to help with after-hours enforcement, & volunteers can certainly do lots to educate visitors. But perhaps the overarching problem stems from years of ever-increasing budget starvation & a conspicuous lack of boots on the ground? Are folks breaking the rules because they figure “nobody’s minding the store” anyway? I suspect so & am convinced that matters will worsen until we all decide to prioritize & sufficiently fund the management of public lands. We need a more sustainable, less polluting solution for camper warmth and meal preparation – one that does not result in burning down our homes. There is a new breed of camper stoves and lights, from companies like BioLite, that offer some hope. Poor human decision making though is hard to solve for.